James B. “Jim” McGee, was born in 1924 in Kinston.. Before he matured into manhood, the hard times of the Great Depression were coming to an end but the clouds of World War II were upon the land. World War II brought many changes in America. In 1942, Franklin D. Roosevelt issued a presidential directive giving African-Americans an opportunity to be recruited into the Marine Corps. These African-Americans, from all states, were not sent to the traditional boot camps of Parris Island, S.C. and San Diego, Calif. Instead, African-American Marines were segregated and sent to Camp Lejeune. What an African-American Marine was allowed to do in the military was limited. Young Jim McGee chose to be a Marine. He was among the first of a group of African-Americans to serve in the Marine Corps. He received his basic training at Montford Point, a facility at Camp Lejeune. The initial intent was to discharge these African-American Marines after the war. In July 1948, President Harry S. Truman issued Executive Order No. 9981 negating segregation. In September of 1949, the Montford Point Marine Camp was deactivated, ending seven years of segregation. Jim was proud of his service in the Marine Corp and served honorably for 30 years. For many of those years, he was a 6442 Aircraft Hydraulic Mechanic and Oxygen System Tester. After his retirement from the Marines, Jim came back to Kinston. He wore many hats in his life from professional boxer and tap dancer to artist and owning and operating an air conditioning/heating business. He was known to his friends as 3-D. He was a lifetime member of the NAACP and was president of the First Congressional District Black Leadership Caucus. It was in Jim’s senior years the Montford Point Marines were honored. 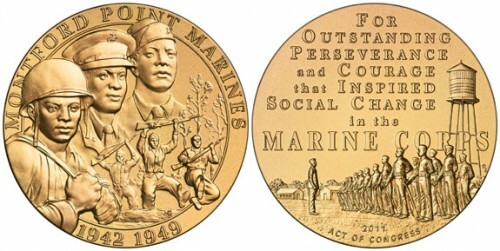 On Nov. 23, 2011, President Barack Obama signed into law the legislation to award the Congressional Gold Medal to Montford Point Marines. The award recognizes Montford Point Marines' contributions to the Marine Corps and the United States from 1942-49 during a time of hardship and segregation. At this time, there were only about 200 of the nearly 20,000 Montford Point Marines still living and most of them were honored at a ceremony in Washington, D.C.
Jim McGee was in a nursing home and unable to attend. The Montford Point Marine Association arranged for a special presentation ceremony at the nursing home with his family and friends present. They all took great pride in their loved one’s recognition as a Montford Point Marine. Jim, suffering from Alzhemiers, passed away later that year, never realizing the respect, honor and appreciation his country had placed on him and other Montford Point Marines. I had the privilege of meeting Jim McGee many years ago. He was a kind, tall and handsome gray-haired gentleman. At the time I was involved with the Kinston Lioness Club and every summer we would have Day in the Park for the Blind. Part of the entertainment was Mr. McGee; he would bring a special board he used for tapping. Jim wanted to be introduced as Mr. Bojangles and then he did the most amazing tap dance routine. The rhythmic sound of those tap dancing feet was a big hit with the blind. Jim came to this event for years. He loved being there and sharing his talent. His audiences loved him. It was an honor and a privilege to have known, Jim McGee, an American hero who hailed from Kinston.